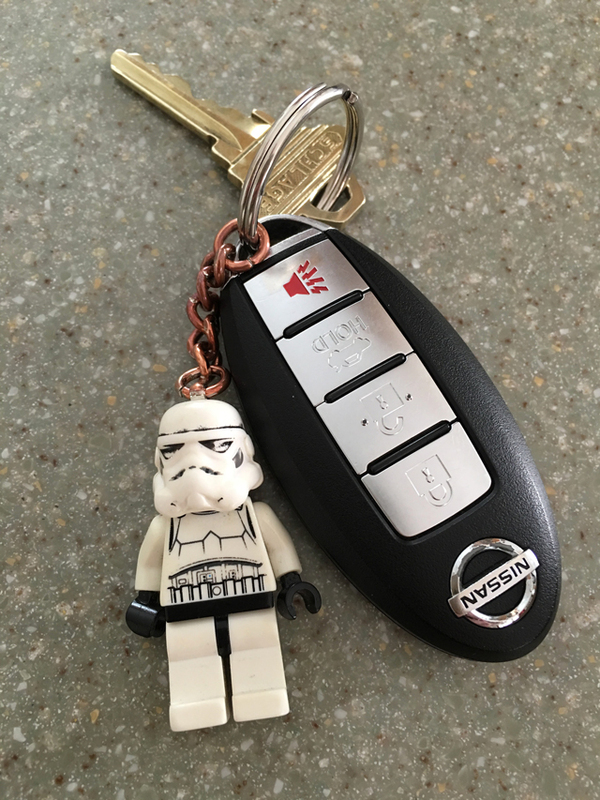 Last time I posted about the LEGO stormtrooper keychain was in October 2014 when I changed out from the LEGO Chewie keychain. 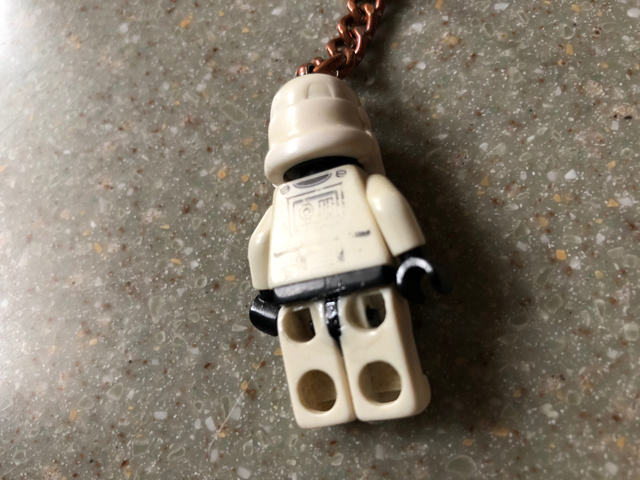 More than three years later, I was ready to replace the LEGO stormtrooper as it was not only well worn, but it lost a piece. 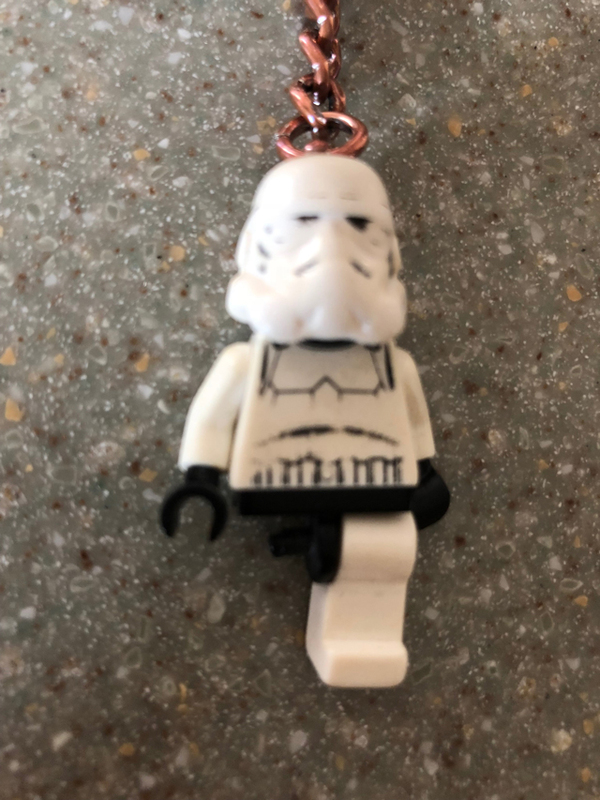 I had glanced down at the keychain one morning in December 2017 and noticed the leg had fallen off. I had no idea where it went. I looked for it in my pants pockets and in the dish where my wife and I keep our keys. It was lost. But not for long. My wife ended up finding it on the floor of the coat closet. Evidently the leg had fallen out of my coat pocket and onto the ground when I took my keys out after hanging up my coat. I was all ready to get another keychain [I have one in waiting], but after thinking about it for a day or so, I decided to give this one an extended life by super gluing the leg back on. I also super glued the still-attached leg so it would not go missing for the long haul. OMG, I never made that connection when I was using super glue. You are the man!!! I have BB-8 on mine, completely worn. Just looks like a nub of white plastic now. I saw the BB-8 keychain at the LEGO store last time I was there. Tempting for a future replacement.